My youngest sister came out to LA this summer from Austin, Texas. I've visited Austin a few times and have always had a great time. We also get along politically, as Austin is a small pocket of Blue in a severely Red State. When I venture into the South, I have to bite my tongue, or tread lightly with my Conservative friends and relatives. (I'm more Grapes of Wrath by John Steinbeck than Fountainhead by Ayn Rand, and This Land is Your Land by Woodie Guthrie than Dog Eat Dog by Ted Nugent.) But nothing settles scores quicker than hitting Stubb's for smoky, tender slices of BBQ sliced brisket and popping open an ice-cold Lone Star Beer. 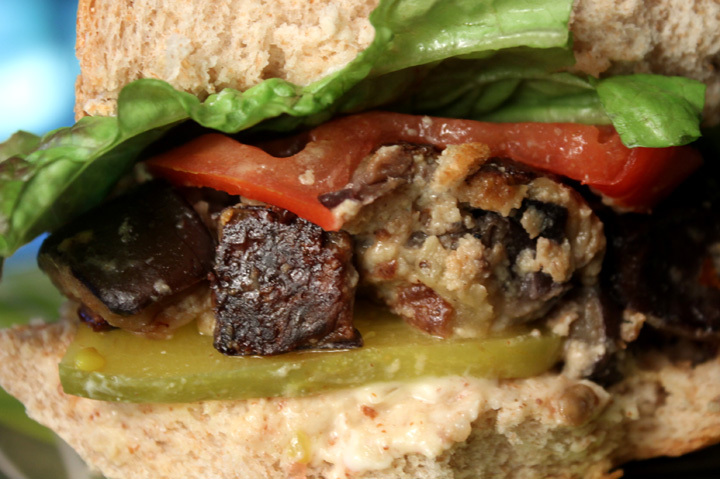 A favorite meal of Dale's is Denise's Eggplant Burger, which she was kind enough to cook in my latest recipe video below. First off we headed to my local 99c Only Store for ingredients. Denise was skeptical but quickly saw the cheap$kate light when we hit the produce section. 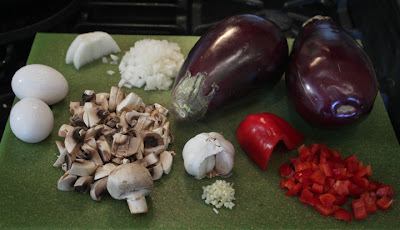 It carried all the fresh vegetable ingredients she needed, including: eggplant (not always stocked, but frequent enough,) red bell pepper, onions, mushrooms and garlic. 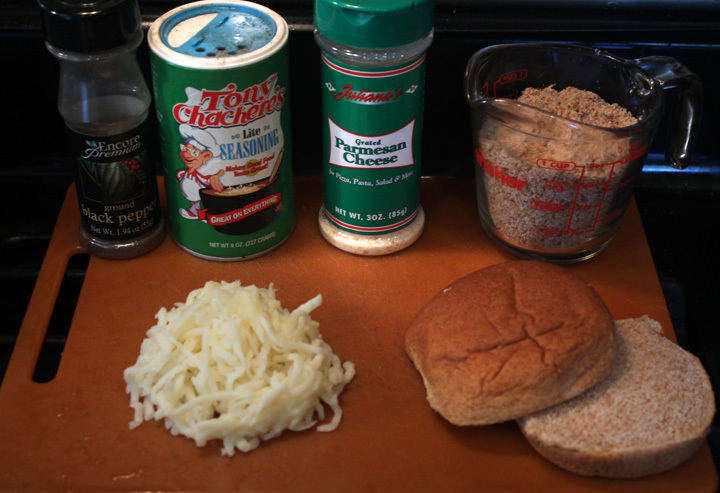 It also carried whole wheat buns and bread for breadcrumbs, eggs, mozzarella, dried parmesan cheese and mayo. I think Denise and Dale are now 99c only Store converts as you will see in the recipe video opening. Denise was literally dancing in the aisles because of all the great deals we found. Back in the kitchen Denise showed me how easy it is to make her Eggplant Burgers. 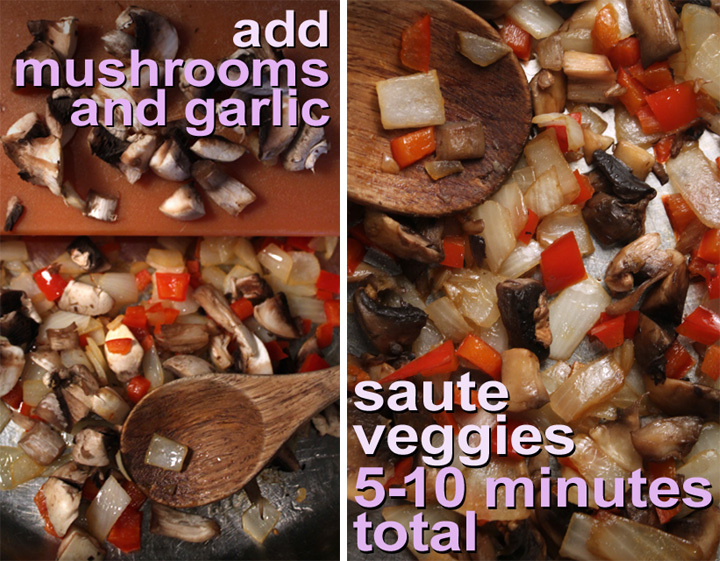 Between the two of us we got the chopping done and went right to sauteing the veggies. 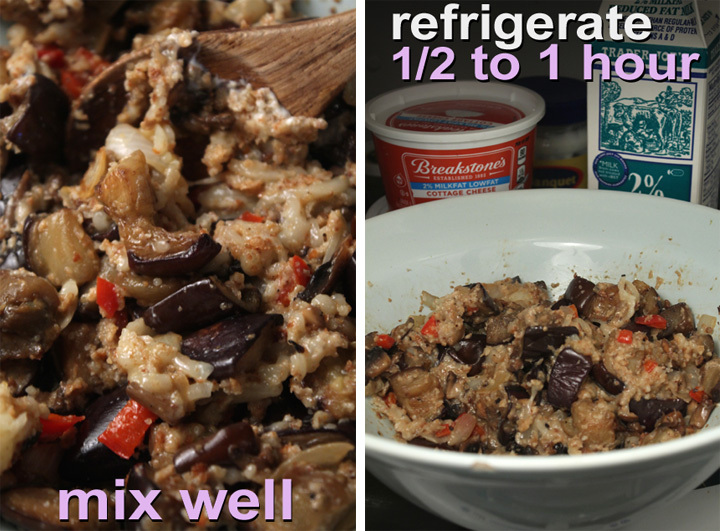 When the veggies are cooked soft, you refrigerate the mixture for about an hour to firm it up, then form and saute the eggplant patties. We ended up making enough for four, with a couple patties leftover, which my wife cooked up a few days later. 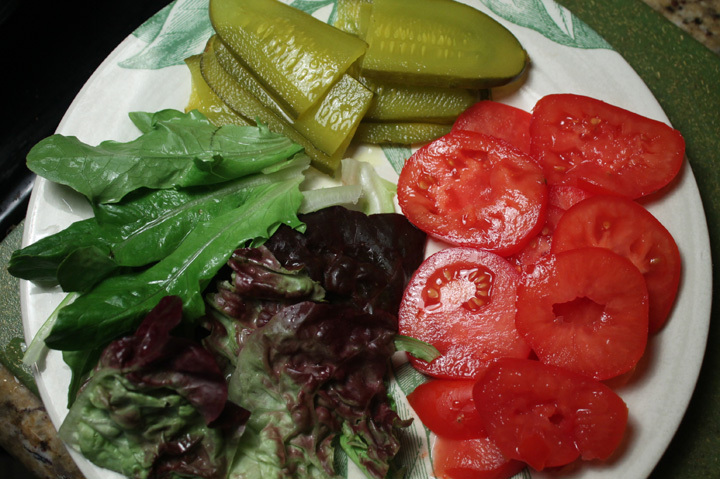 Did the recipe turn me into a vegetarian? Not quite, but they were one of the best veggie burgers I've had. Big fat veggie patties seared crunchy on the outside, but still soft on the inside, this burger had it all. But don't take my word for it, just watch the end of the video to get other satisfied diner comments. 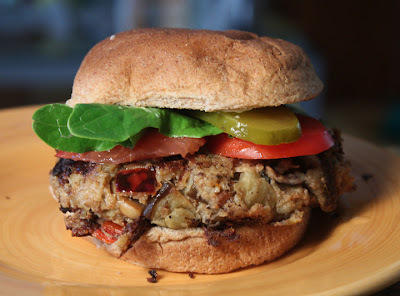 So check out Denise's Eggplant Burger video recipe below, and see how deliciously easy it is to make your own. Play it here, video runs 8 minutes, 34 seconds. And 99 thanks to Dale for shooting the Chef. 2 medium eggplants - diced into 1/2 inch pieces. About 8 cups total when cubed. 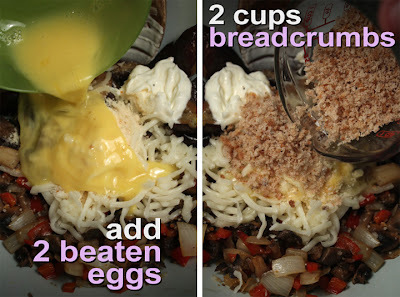 My video uses 1 1/2 eggplants, so I am adding an extra cup of breadcrumbs to recipe (for 2 whole eggplants.) 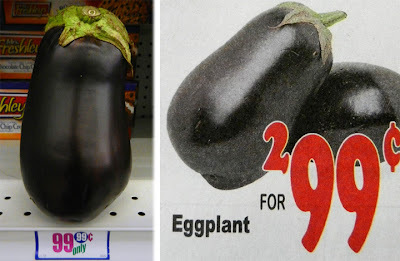 Okay to use Japanese or any type of eggplant, but may need to double or triple the amount, depending on size. 1/2 cup chopped onion - any type. 1/4 bell pepper - red for the video recipe, but any color is okay. 1 cup mozzarella/parmesan - mostly shredded mozzarella and 4 tablespoons of cheap dried parmesan. 2 cups breadcrumbs - Okay to use dried and packaged. I made fresh. Just blender 2-3 slices of bread until fine crumbled - pulse/blender about 30 seconds. 1 tablespoon oil for onion, bell pepper, mushrooms and garlic. 2 to 3 tablespoons oil for frying eggplant - may need more to keep from sticking, if cooking eggplant in batches. 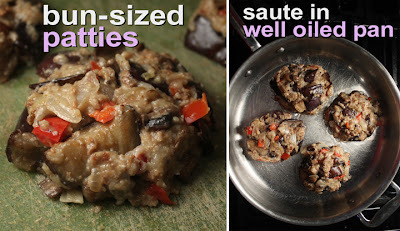 And 2 to 3 more tablespoons of oil for sauteing eggplant patties. Salt and pepper to taste - or Cajun Seasoning, like Tony's Chachere's. Bread for veggie burgers - I used whole wheat buns, but okay to use any favorite bun or bread slices, even pita bread. Favorite burger toppings like lettuce, tomato and pickles, with mayo, mustard and/or ketchup. 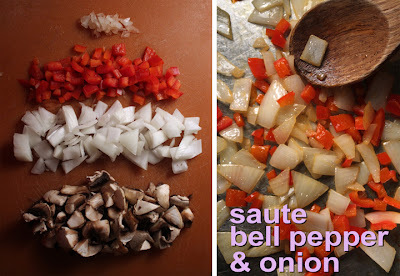 Saute chopped onions, bell pepper and mushrooms in oil over medium heat about 5-10 minutes. When soft add garlic and saute for another minute. Cube 1 1/2 eggplants into 1 inch pieces, okay to leave skin on. In a large pan, saute eggplant in oil over medium heat until very soft, about 10 to 20 minutes. When all veggies are cooked, allow to cool about 5 minutes before adding eggs. In a large bowl mix all cooked veggie ingredients, including eggs, cheese and bread crumbs. Start to heat 2 - 3 tablespoons of oil in a large frying pan over medium heat. Form chilled eggplant mixture into patties, about an inch thick and big enough to fill a hamburger bun. Cook eggplant patties about 5-10 minutes each side until dark brown. I find it best to not move the patty for 3-5 minutes, so a crust forms that helps keep the patty from breaking apart and sticking even more to the pan. 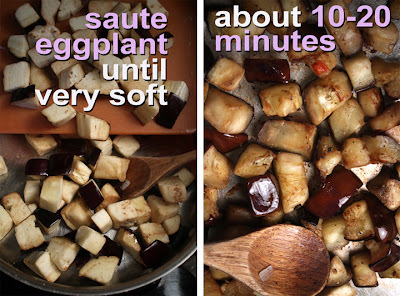 Depending on how small the eggplant pieces are, a few may separate from patty - so either press them back in or chow down on loose pieces when done. And make sure to loosen each patty totally from pan, or they will break apart when turning them over. You can get out and prepare all your hamburger toppings before the eggplant patties cook. 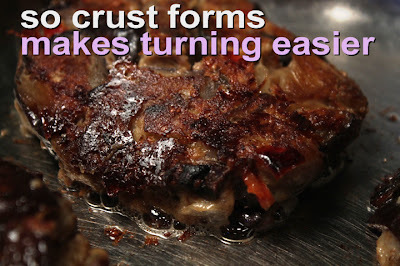 The cooked texture is a mix of crunchy outside and soft, mushy interior. So it may seem undercooked, but as long as the outside is well browned, the mixed egg inside will be done. Soft bread or buns are preferred as eggplant patty may squish and break when chewy bread is used. If your eggplant patties are too crumbly, try adding one more egg to mixture (which will help firm up the patties as they cook.) Also, smaller eggplant pieces will hold together better, and make sure the eggplant cubes are cooked long enough to be very soft. I left the skin on my eggplant so browning may be hard to see, but cook until the outside is dark brown. If you are carb-phobic, Denise's Eggplant Patties are delish on their own, served with your favorite sides, or a salad. Great video. I remember Denise from the corn dog party. You have a nice family. I'll be trying this recipe soon. Will let you know how it comes out. 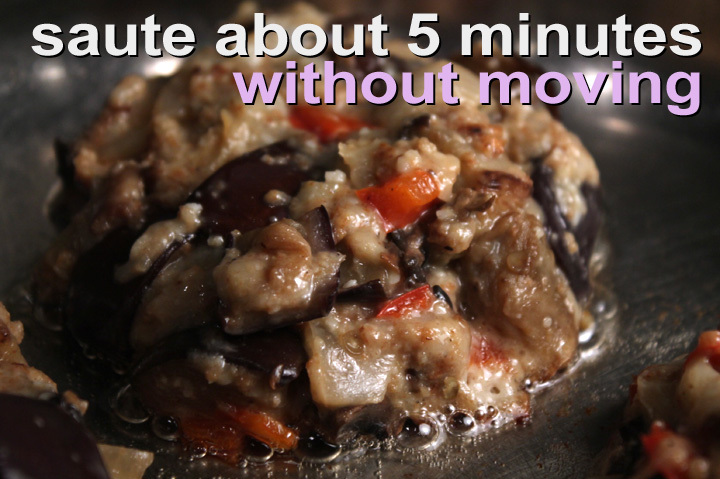 Eggplant is my fave veggie so I'm always trying to come up with new ways to prepare it. This evening I finally got around to making this (haunting me) recipe and it was awesome...seriously awesome!!! I didn't even put it on any type of bread just dipped it in light sour cream mixed with a little bit of sriracha. Thank you for sharing and thank you for the video (which was entertaining and extremely helpful.) So glad I found your blog!!! Next up? Your Chicken Tinga of course Can tell already I'm gonna love it...:)). Yummy recipes..Thank you for sharing.